Children’s book “The Birthday Cache”; exclusive sneak peak, and giveaway! Today, we have a guest post from Teacher and Author Amanda Zeiba, and are presenting a sneak peak of the entire first chapter of her new book “The Birthday Cache”, which is on sale now! She has graciously allowed us to give away a copy of the book. Simply post a comment to the post for a chance to win. Seeing as the OCNA blogger is going in for surgery the day after this post, we will leave this contest open for two full weeks; the comments will be assigned a number 1 thru X, and the winner will be chosen on Tuesday, January 31st via a random.org drawing. NOTE: We totally blew the date on that (now corrected); but we will therefore extend the contest until Friday, Feburary 3rd, 2017. 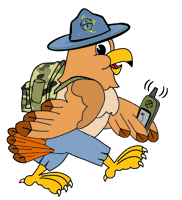 Do you love geocaching? Love reading? Have a young reader/cacher in your life? Looking for a good book to read as a family? 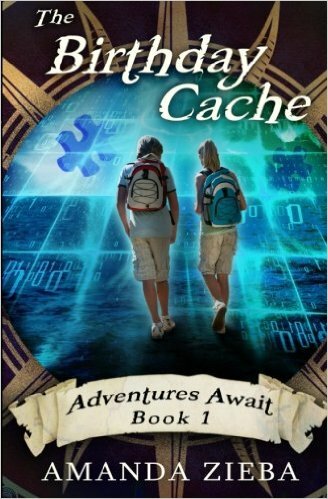 If you said yes to any of these questions, The Birthday Cache, the first book in a new geocaching adventures series, is for you! While twelve year old Mason Miles and his parents love their nomadic lifestyle living and working across the nation in their RV, his twin sister Molly is craving a normal life and scheming to put an stop to their endless road trip. For their twelfth birthday the twins open a GPS receiver and fall in love with the sport of geocaching. When they stumble upon a mysterious puzzle cache will their travels become interesting enough to change Molly’s mind? The first chapter is written below. Give it a read, then respond in the comment section for a chance to win your very own copy. Gotta have it right now? The book is available in paperback and Kindle versions on Amazon. Just click here: https://www.amazon.com/s/ref=nb_sb_noss_2?url=search-alias%3Daps&field-keywords=Amanda+Zieba and scroll to find your preferred version. Amanda Zieba is a full time teacher, a wife and mother always, and a writer any minute she can squeeze in. She is the author of numerous children’s books and one adult novella. In addition to writing, she loves visiting schools and facilitating writer’s workshops for young writers. Molly stomped through the woods clutching a brand new GPS receiver in her hand. Following the path highlighted on the screen only occupied part of her brain. The rest was busy listing complaints. Complaints about their life on the road. Complaints about the lack of privacy for a twelve-year-old girl inside an RV. Complaints about missing her grandparents, friends, dance classes, and a thousand other things in Boston. But her biggest complaints were about her birthday. I wish I was celebrating my birthday with my BEST FRIEND. But noooo, instead I am walking through the middle of the woods, for FUN. I’d rather be with Gabby, eating ice cream or going to the mall, or doing ANYTHING else NORMAL! Molly paused, looking left and then right. Frustrated with every part of the adventure, she sighed loudly and mentally gave up. “Here.” Molly shoved the GPSr into her twin brother’s hands. It’s a better present for him than me anyway. She folded her arms across her chest and dragged her feet, letting Mason take the lead. Their parents walked behind them, sandwiching Molly between them and her obnoxiously happy brother Mason. “Some happy birthday this is,” she muttered. “What’s that, Mol’ Doll?” her dad asked. “Nothing.” She spoke a little louder than she meant to, causing a nearby bird to cry out and fly away. The foursome wove through the trees, doing their best to follow the directions displayed on the GPSr. Mom snapped pictures with the camera that was permanently attached to her hand. Molly rolled her eyes, but continued to follow her know-it-all brother. He was always spouting annoying facts. Finally they reached the spot they had been searching for. When they discovered that it wasn’t a traditional cache, Molly’s annoyance grew. Instead of unclasping the hinges of an old ammo can or prying the cover off a film canister, they stood huddled around a square sign. It read: Original Stash, the first geocache placed here, May 3, 2000. N 45° 17.460 W° 122 24.800. A traditional cache was a hidden container that held something you could take with you as a souvenir. Once you picked out an item, you replaced it with one of your own. They’d collected all kinds of things from caches: coins, keychains, and magnets. Here they were stuck with no treasure to find or trade, just a plaque to look at. “Virtually lame,” Molly said, and then guiltily shrugged when she realized she’d said it out loud. “Well, we can’t miss out on that!” Mason said and put the GPSr on top of the plaque. “Do we pray to the GPS gods or do a rain dance or something?” Mom asked. “Nope. It should be good,” Dad said. “Great. Can we go back to the RV now?” Molly asked. “Really? You’re not just saying that?” Molly asked, stopping to look at her mother. “I really mean it,” her mother said and gave Molly’s hand a quick squeeze. Maybe Gabby’s plan isn’t totally hopeless, Molly thought. She almost told her mother the plan she’d worked so hard on right then and there. She opened her mouth but then closed it when she saw her mother was already several feet down the trail. Molly shrugged. She’d tell her parents the plan later. For the rest of the way back to the RV, Molly walked instead of stomped.